Polyfibre Black Venom 16L poly tennis string review. 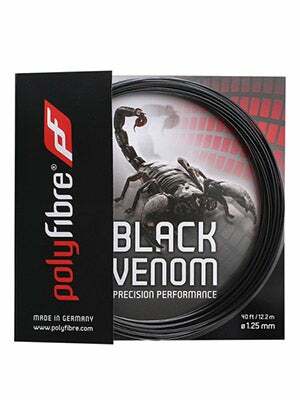 I tested another set of a black colored tennis string, so I had to review the Polyfibre Black Venom string. Black strings are the new rage in the tennis world, so I try to review every black tennis string on the market. Polyfibre introduced the Black Venom about a year ago and it has been getting some praise for it’s durability and performance, so I just had to try it. Stringing the Black Venom was fairly simple considering it is a stiff poly. I was able to string my tennis racquet quickly and knotting off the ends was a snap; I strung a one piece at 59 pounds. On court, the Polyfibre Black Venom were pretty neutral. What I mean is, that I wasn’t blown away with the performance right off the bat. The strings felt really stiff and while it offered a lot of pop, it lacked control. That was the story for the first hour of hitting with the Polyfibre Black Venom, then the strings settled in the bed and that’s when the fun began! 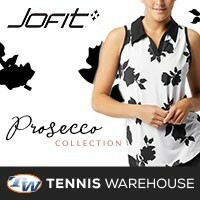 The shots stated to come to life, I was starting to feel the tennis ball pocket and leave with smooth acceleration. The spin I was able to produce with the Polyfibre Black Venom was nothing extraordinary but it was enough to get some decent kick off most of my groundstrokes. Once I felt more ball connection with the Polyfibre Black Venom, I discovered the power that the strings possessed. 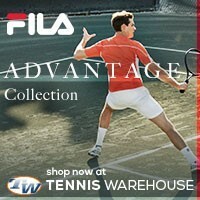 Hitting deep shots with pace was simple, my arm felt fine – still not as soft as other tennis strings but close enough. 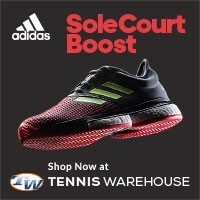 When serving, the Polyfibre Black Venom really sent the ball away with great pace on flat serves and kick serves I could really feel the strings ‘bite’ the ball allowing for addition spin. I was pretty impressed with how much spin I was able to produce on serve. Though, I was more impressed with the spin than the power, especially for a poly. At net, the Polyfibre Black Venom performed as I had expected it would. 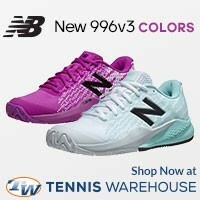 Volleys were crisp and penetrating and I didn’t have to put much on my volleys. The only aspect of this particular tennis string was the touch, while I could feel a lot of my shots, touch shots were challenging to produce, especially at the net playing full speed. The tension maintained itself rather well, after about four hours of hard hitting, the string only loosened up a little bit and I was still able to get the performance I did around hour 2 of hitting. Overall, I think that Polyfibre has done well with the introduction of the Polyfibre Black Venom, it’s got good pop, spin capabilities, and feel. I would have to say that the Polyfibre was pretty even in pros and cons; the power outweighed the control, the spin outweighed the control, and the feel outweighed the touch shots. Pretty good string for those looking for a comparable and less expensive set of tennis string than the famous RPM’s. Oh and I recommend stringing the Polyfibre Black Venom at least 2 pounds tighter than what you normally do, so when the string settles, it will settle closer to what you prefer in string tension.